Onion quotes are not always given the level of attention they deserve. We’ve assembled a fun and interesting list of quotes about the vegetable that provides so much value to so many meals. Its easy to take for granted the ubiquitous onion. We use them in so many ways. Cooked or raw, it is a great, low calorie way to add flavor to all types of cuisine. But when you peel back the layers (sorry), you find it offers more than just a little added flavor to any meal. Check out these facts and cooking tips. Here is a list of some fun and thought-provoking sayings about the garden favorite. Use one next time you’re creating a culinary masterpiece in the kitchen or drop quotation into your next foody blog post. An onion can make people cry but there’s never been a vegetable that can make people laugh. I will not move my army without onions! It doesn’t matter how precisely the onion is cut as long as the person chewing it is happy. It’s hard to imagine civilization without onions. Scallions, or green onions, are actually immature yellow, red or white ones, harvested before the bulb begins to form. “Spring and salad onions” are other aliases for immature ones. My last refuge, my books: simple pleasures, like finding wild onions by the side of a road, or requited love. Onions and bacon cooking up just makes your kitchen smell so good. In fact, one day I’m going to come up with a room deodorizer that smells like bacon and onions. It’s a fabulous smell. For an Apple is in it self a little Universe; the Seed, hotter than the other parts thereof, is its Sun, which diffuses about it self that natural Heat which preserves its Globe: And in the Onion, the Germ is the little Sun of that little World, which vivifies and nourishes the vegetative Salt of that little mass. Chili is one of the great peasant foods. It is one of the few contributions America has made to world cuisine. Eaten with corn bread, sweet onion, sour cream, it contains all five of the elements deemed essential by the sages of the Orient: sweet, sour, salty, pungent, and bitter. 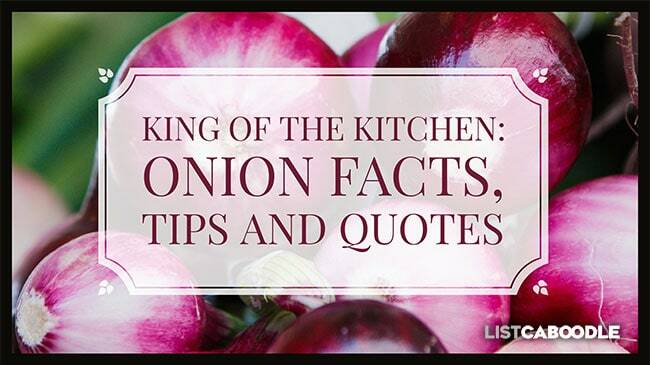 Onions can make even Heirs and Widows weep. Why should I paint dead fish, onions and beer glasses? Girls are so much prettier. Mine eyes smell onions: I shall weep anon. Onion is a great substitute for salt and adding flavor to low-sodium diets. A woman’s chastity consists, like an onion, of a series of coats. Acting is like peeling an onion. You have to peel away each layer to reveal another. Good intentions are not enough. They’ve never put an onion in the soup yet. It’s toughest to forgive ourselves. So it’s probably best to start with other people. It’s almost like peeling an onion. Layer by layer, forgiving others, you really do get to the point where you can forgive yourself. Here are some informative facts and tips. They are a good source of biotin, which helps regulate blood sugar and insulin resistance. Biotin also contributes to healthy skin and nails. Sulphuric compounds assist in protien synthesis and building cell structure. They are rich in antioxidants like vitamin C, as well as the mineral manganese and phytochemicals that help strengthen the immune system. The plant flavonoid quercetin found in this vegetable fights cancer-causing free radicals in the body. Quercetin also helps fight stress. It works by supressing cortisol production, which can damage muscle tissue and break down proteins. A raw version helps lower LDL (the bad cholesterol) and promotes HDL production (the good cholesterol). Chronic inflammation, especially joint pain and arthritis, can be battled with anti-inflammatory properties of this vegetable. Sulfuric compounds act as blood thinner which helps prevent clotting, which can lead to improved blood pressure, cardiovascular function and guard against stroke. Quercetin also helps prevent plaque concentrations in arteries. The high fiber content help maintain good digestion. Folate improves appetite, aids sleep and fights depression. They consist of up to 90% water plus 8-9% soluble sugars. The rest is minerals, fats, sulfur compounds and proteins. Why cutting makes you cry? Cutting and slicing releases a volatile gas (propanthial s-oxide). When the gas reaches the eye, sulphenic acid is formed. The result is the familiar stinging sensation followed by tears. Even small amounts of the chemical released into the air can irritate the eyes. How to cut an them without tears? Chill them in the refrigerator for 30 minutes prior to cutting. Avoid cutting the root end, which has the highest concentration of sulphuric compounds (eye irritants). Cut it under running water or while submerged under water. What is the best way to store them? Keep whole, unpeeled varieties in a cool, dry place with good ventillation. A mesh bag provides good ventilation. Avoid storing them in plastic bags. The lack of ventillation will make for a shorter shelf life. Wrap sweet onions in paper towels or newspaper and keep refrigerated for longer storage life. How to avoid bad breath? Sauté them with a low to medium heat. Cooking before eating can reduce onion breath. If eaten raw, your breath can be freshened by chewing a citrus peel or sprig of parsley, or rinsing your mouth with equal parts lemon juice and water. What’s the difference between yellow, red and white varieties? The very popular yellow variety is a great all purpose vegetable. It has a sweet, mild taste and is full flavored. The yellow version is good for carmelizing, turning a rich, dark brown color. It provides the distinctive flavor to French onion soup. Maui – Has a less sulfur taste, more sweet and mild. Vidalia – This popular sweet and low sulfur vegetable came from Vidalia, GA region. Walla Walla – The pride of Washington state, this variety has a very mild flavor. The Walla Walla’s greater water and sugar content means it has a shorter shelf life than most others. The delicious red variety is often used in salads and sandwiches for added color and taste. They can have a moderate to very pungent range of flavor. The white variety is used less frequently than either yellow or red varieties. Whites are commonly used in Mexican and Southwestern cuisine as well as in salads. They can range in pungency but have a crisper flavor than other kinds.. Onions are toxic to many animals including cats and dogs. As members of the Allium family (including garlic, chives and leeks), they contain N-propyl disulfide, which damages hemoglobin in the bloodstream. The condition is called hemolysis. Red blood cells are ruptured and flushed from circulation, producing red or brown colored urine. The resulting anemia can lead to damage or failure of internal organs and may even lead to death of the animal. Learn about more foods that you should not feed your dog. We hope you have enjoyed this read. Add even more spice to your cuisine with peppers! Check out this listcaboodle Guide to Picking the Perfect Pepper. For handy kitchen tips and tricks, check out Teaspoons to Tablespoons and 11 other things you should know.